Robert Zhao Renhui will also be part of Myth and Image, a panel discussion with documentary photography Ore Huiying and moderated by Tom White. ICONS is a long-term project that outwits and questions the documentary aspect of photography. Influential photographs from landmark events of the 20th and 21st century, that have been imprinted on our collective memory, are reconstructed as three-dimensional models – a meticulous bricolage of cardboard, sand, wood, fabric, cotton wool, plaster and glue. The reconstructions are again photographed in such a way that they come amazingly close to the original. But the illusion is always humorously broken by the studio atmosphere surrounding the familiar image. Swiss artists Jojakim Cortis and Adrian Sonderegger began their collaborative work while studying photography at Zurich University of the Arts (ZHDK) in 2005. 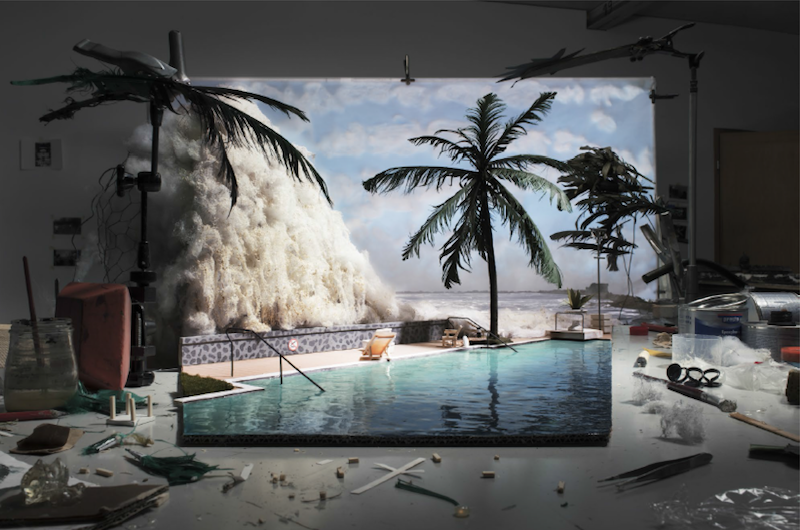 They conceive and manufacture surreal worlds in compositions of “staged” photography. They were recently awarded 2019 Photographer of the Year by the Swiss Photo Academy, and have also exhibited their works in festivals and galleries internationally. More info at https://www.ohnetitel.ch/. The Land Archive manages an extensive archive of documents from private memoirs, historical maps and photographs, to oral history interviews and audio-visual materials, some of which date back to the early 19th century. This series chronicles the significant changes in Singapore’s natural and urban landscape that have occurred over a 100-year period. The images have been carefully selected by researchers from The Land Archive to capture the changing face of this tropical island-state. They touch on issues of land reclamation, national boundaries, ecological changes, pollution, conservation and the ever-evolving skyline. The pictures capture an ongoing dialogue between the city’s man-made infrastructure and its natural spaces and creatures. While Singapore’s architecture is documented in aerial views of the country’s tallest buildings and its ubiquitous public housing, there are also photographs of the island’s wildlife. These include fauna in Marine Parade, native animals in the wildlife reserves, which houses one of the biggest collection of animals in captivity, and its last few wild animals. Singaporean visual artist Robert Zhao Renhui works mainly with photography but often adopts a multi-disciplinary approach by presenting images together with documents and objects. His work includes textual and media analysis, video, photography and book projects. Robert’s works has been shown and published widely across the world, and his accolades include The Deutsche Bank Award in Photography (2011) by the University of the Arts London, The United Overseas Bank Painting of the Year Award (2009) Singapore, and The Young Artist Award by the National Arts Council. View his works here: http://www.criticalzoologists.org/.